These strategies help clients stay with the discomfort of urges without automatically or impulsively reaching for ultimately harmful ways to stop them. Increasingly, mindfulness—which might be summarized as sustained, nonjudgmental attention—is at the heart of a number of clinical approaches to relapse prevention for individuals with substance use disorders. Following is a sampling of the various ways clinicians are using mindfulness-based strategies to help their clients with substance use disorders prevent relapse—all techniques social workers can incorporate into their practice. As a graduate student at the University of Washington in Seattle in the early 2000s, Sarah Bowen, PhD, studied with the late G. Alan Marlatt, PhD, then professor of psychology at the University of Washington and director of the university's addictive behaviors research. Marlatt had been researching cognitive behavior techniques for relapse prevention for more than a decade and began studying how meditation might play a role. Bowen, along with Marlatt and his team, realized that "we needed to integrate these two promising approaches, which had been up until that point parallel but separate research streams." At the time, research on meditation was linked to Buddhist practices—not a likely topic to help them land research grants—so to create a practice that fit better into a contemporary, recognizable Western model, Bowen says, they blended the protocols and structure of Jon Kabat-Zinn, PhD's, mindfulness-based stress reduction program and cognitive psychologist Zindel Segal, PhD's, mindfulness-based cognitive therapy program that was being used in the treatment of depression. "We used those protocols as a guide to integrating the mindfulness practices showing evidence of benefit with the existing evidence-based practices in relapse prevention," she says. The end product, an aftercare program for people in the early to mid stages of recovery, is designed to help clients maintain treatment goals that have been gained in initial treatment. According to Bowen, now a clinical psychologist and associate professor at Pacific University, it aims to raise awareness of relapse precipitants, which is very often negative mood but may also be situational, such as being around people who trigger cravings. "It helps people find their personal relapse signature—what it is for them individually that puts them at risk, and it helps them learn how to stay with the associated discomfort and distress without automatically or impulsively reacting," she explains. Participants practice in session and are given assignments for individual work to help them stay with feelings that seem intolerable and make them want to use and are helped to recognize that they can tolerate these feelings and that the feelings will pass. It's achieved through a practice the developers call urge surfing. "There's the natural urge to escape from something aversive, but we can practice staying with it, being gentle around it, and riding it out until eventually it passes. Clients learn that they can be with things they don't want to feel, and that these feelings will pass, and they will be okay. That's the message," she says. "Whether it's anxiety, fear, or anger, through mindfulness they can sit with the feeling, be in direct contact with it, and ride it out." The first clinical trial of the intervention was done in 2009, and the largest randomized trial was published in 2014. It randomized people who had been through treatment and were in aftercare to their treatment as usual, which was a 12-step or standard relapse prevention or cognitive behavior approach, or to the mindfulness-based relapse prevention program. The participants completed the course and were followed for a year. Everyone improved, Bowen says. "After treatment, they were better than before treatment, but we started to see real differences between treatments after about a year. The people in the mindfulness-based relapse prevention program were able to maintain abstinence for that period of time at a higher rate, or when they did relapse, didn't do so as severely; if they were using again, they used less and were able to get back on board more quickly." Mindfulness-based relapse prevention aligns closely with social work values, Bowen says. It's not psychoeducation, she explains, and it's not a corrective approach. "It's not about teaching people skills they don't have but we do. It's sitting with a group of people and acknowledging that we're all in the same boat and have minds that do things that aren't helpful. The goal is to explore with the clients what we can learn about our minds that could be helpful to us, and how we can train ourselves to be better allies to ourselves." The program, Bowen says, stands on its own because it's designed to be an integration of different kinds of therapies, including cognitive behavioral therapy, relapse prevention, and motivational interviewing, to meet clients where they are, and to help them resolve ambivalence. "We tried to take the best practices in the addiction field and bring them all together with mindfulness-based practices," she says. Training is available to mental health care workers and health professionals of all sorts. Social workers can visit www.mindfulrp.com to learn more. They will be able to use that training, Bowen says, with many other kinds of clients for everything from anxiety and panic to domestic violence and eating disorders—anything involving behavior change. Nick Turner, LCSW, is coauthor with Phil Welches, PhD, and Sandra Conti, MS, of Mindfulness-Based Sobriety: A Clinician's Treatment Guide for Addiction Recovery Using Relapse Prevention Therapy, Acceptance and Commitment Therapy, and Motivational Interviewing. Working at Gateway Foundation in Chicago, the authors had been using traditional cognitive behavioral therapy approaches and wanted to incorporate additional modalities. Because they could find no fleshed-out models, they developed mindfulness-based sobriety, an integrated model based on the elements of the three evidence-based practices that's facilitated and enhanced through meditation. Through motivational interviewing, therapists can meet clients where they are, allowing them to acknowledge ambivalence and helping them identify and strengthen their motivation for change without coercion. Acceptance and commitment therapy (ACT) helps clients accept and clarify their feelings rather than wrestle with them and to explore values and commit to change in the context of those values. The relapse prevention therapy component, based on Marlatt's work, uses mindfulness-based techniques such as urge surfing to help individuals acknowledge, be present for, and sit with uncomfortable feelings without reacting to or acting up them. Sessions begin and end with mindfulness practices that encourage nonjudgmental awareness. Turner, a clinical social worker and certified alcohol and drug counselor who works at the Road Home Program for Veterans and Families at Rush University Medical Center and is an adjunct lecturer at the University of Chicago School of Social Work, says the approach "doesn't clash with any other treatment modality," so it can be used by all social workers in the addiction field. It can, for example, be integrated with 12-step facilitation and harm reduction practices. "Because we stop short of defining what sobriety means, it can be used when working with clients to reduce use or abstain from a certain substance, or anywhere on the spectrum of treatments, in addition to education and traditional treatment approaches." It's not focused on disease models or on labels, but rather on asking people what's important to them and helping them learn skills based on their responses, rather than solely focusing on abstinence, he explains. Turner sees the approach as aligning well with social work values. It's designed to be collaborative and empathic. "Traditional substance abuse treatments can be in some ways disempowering because they say, 'You have this disease, you are this thing, you have it for the rest of your life.' In contrast, mindfulness-based sobriety focuses on enhancing their quality of life, practicing with compassion, and being person-centered. The curricula—the exercises and the language in the book—are empowering, encouraging people and meeting them where they are, helping them take the reins in their life and make decisions." For social workers who wish to incorporate mindfulness-based sobriety in their work, formal training is helpful but not essential, says Turner, who notes that Mindfulness-Based Sobriety was written to provide step-by-step instructions. The lessons in the book will allow social workers to practice across the board, not just with substance abuse but also with process addiction and avoidance behaviors in general. He adds, however, that to have more in-depth knowledge and experience, it's useful to be trained in motivational interviewing and ACT to deeply understand the core concepts, although it's not mandatory. In 2006, Eric Garland, PhD, LCSW, a professor and associate dean for research in the University of Utah College of Social Work and director of the Center on Mindfulness and Integrative Health Intervention Development, became interested in developing a mindfulness-based intervention for the treatment of addiction. At the time, no empirically supported programs existed and few studies had been published. That same year, he came across what he describes as a quasi-experimental study coauthored by Bowen of traditional Vipassana meditation (Buddhist insight meditation) used with incarcerated individuals with substance use disorders. It inspired him to develop a mindfulness program to treat addiction that was founded on mechanistic insights from basic biobehavioral research and neuroscience. Further research into the "cognitive, affective, and psychophysiological mechanisms underpinning addiction" and the development with colleagues of a conceptual framework of stress-precipitated addictive behavior integrating several prominent theoretical modes led to the development of his program, Mindfulness-Oriented Recovery Enhancement (MORE), the manual for which was published by the NASW Press in 2013. MORE was first developed as a treatment for drug and alcohol addiction, and a version was developed in 2010 to address chronic pain and prescription opioid misuse, Garland says. He describes MORE as "a mental training program that unites complementary aspects of mindfulness training, 'third wave' cognitive behavioral therapy, and positive psychological principles into an integrative treatment strategy." He points to three core concepts. First, mindfulness allows clients to recognize when their attention is fixed on stressors, physical or emotional pain, or addictive cues; increase their control over such fixation; and reorient their attention to their breath. Second, he says, cognitive reappraisal of maladaptive thoughts helps them cope in stressful situations. "Clients are taught to mindfully disengage from negative appraisals of stressful events and restructure them until they abate and positive reappraisals are constructed to promote resilience, meaning in life, and active coping techniques," he explains. The last component is savoring: clients are encouraged to use mindfulness to bring their attention to naturally rewarding experiences and savor them. The program is different from other mindfulness-based interventions, Garland says, because it uses mindfulness training to promote "positive psychological processes to improve health and well-being." In that way, he adds, "the treatment is truly integrative, combining the complementary strengths of different therapeutic techniques into one synergistic approach." MORE's effects have been validated by numerous randomized controlled trials published in many journals. More than $25 million in federal research grants funded by agencies such as the National Institutes of Health and the Department of Defense are supporting research into MORE and mindfulness as a treatment for prescription opioid abuse. 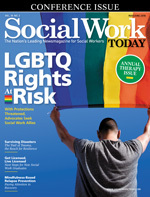 Like the other approaches discussed, MORE closely aligns with social work values. "I designed MORE with a strengths-based, empowerment focus," Garland says, "one that recognizes the inherent capacity of individuals to transcend and transform their limitations into opportunities for growth and well-being." Social workers, he adds, "have a major role to play in nonopioid treatment for chronic pain." He envisions a future in which people with chronic pain will be prescribed not only a limited amount of medication, but also mindfulness-based intervention along with an exercise and nutrition program. He believes this could prevent problems and suffering "down the line" and may even prevent acute pain from becoming chronic pain. "There's no profession better suited than social work to deliver community-based mindfulness interventions in the context of primary care," he says. "It's my sincere hope that a cadre of talented social workers will become trained in MORE and integrate this social work intervention into a wide range of health care settings. This effort will create many good jobs for social workers while at the same time alleviate human suffering." To lead programs, social workers would need to complete a two-day clinical training workshop, as well as have a personal mindfulness practice and experience treating patients with addiction, stress, and pain, Garland says. Training is offered at a variety of locations and more information is available online. Leslie J. Temme, PhD, LCSW, RYT, has been working in the addiction field for more than 30 years, most recently researching the role of mindfulness in the treatment of substance use disorders. She also teaches social work clinicians how to integrate meditation, along with other alternative practices such as yoga, into their clinical work. In an outpatient setting, Temme uses Integrative Restoration (iRest) as well as slow, mindful yoga to complement addiction treatment. Richard Miller, PhD, developer of iRest and author of Yoga Nidra: A Meditative Practice for Deep Relaxation and Healing, wrote that Yoga Nidra might be described as the practice of pratyahara, which "is classically defined as the process of withdrawing the mind from distracting sensory impressions such as sounds, smells, sights, and thoughts so that the mind abides in a calm and undisturbed state of silent witnessing." According to Temme, "It has been posited that meditation is an antidote to substance use because it enhances attention to the mind and awareness of the behavior of the mind—as well as thoughts and feelings—as they occur. This includes paying attention to physical or emotional states that may be uncomfortable or unpleasant. The reduction in reactivity to these negative thoughts and feelings is thought to allow for exposure to and acceptance of these experiences." With respect to relapse, she adds, meditation allows individuals to recognize a state of "being on autopilot" and instead cultivate the ability to pay attention and sustain this attention. It has also been suggested that the brain activity that creates automatic pilot is interrupted by the practice of meditation, which, in turn, fosters self-regulated behavior. Temme's study, "Evaluation of Meditation in the Treatment of Chemical Dependency," looked at the use of a 45-minute iRest practice three times a week in a group setting. Participants had been diagnosed with chemical dependency and were residents of a long-term therapeutic community. Results indicated the efficacy of the intervention for reducing risk of relapse as well as reducing negative mood states. Temme and other experts propose that mindfulness practices may be most useful in relapse prevention. "It seems that perhaps clients in early recovery may not be able to sustain attention well enough to fully participate in mindfulness practices," she says. However, because they help foster improved attention as well as enhanced awareness and acceptance, it is certainly worthwhile to continue to offer such practices. "It's important that any practitioner considering using mindfulness techniques have a full understanding of what these practices are and how they may influence a client," says Temme, adding that training is essential. She recommends that social workers enroll in a certified mindfulness training program from a reputable center. And to learn more about Yoga Nidra and training opportunities, social workers can visit Miller's Integrative Restoration Institute online at www.irest.us. According to Temme, "Most proponents of mindfulness approaches believe clinical practitioners should have their own personal mindfulness practice before adding it to their repertoire of clinical interventions." Bowen agrees that it's critical that mindfulness practice really be of interest and central to your life as a clinician if you are going to work with these techniques with clients. It's experiential and collaborative, she says, adding that "trying to guide someone in something that you haven't done yourself doesn't feel ethical. It doesn't have to be perfect; it just has to be part of your life."